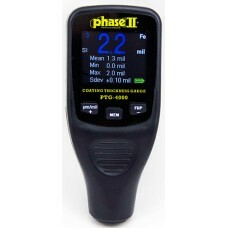 Phase II+ Paint Thickness Gages are featured packed and affordable providing quick, accurate measurements for the automotive, aerospace and general manufacturing industries. All paint thickness meters are on sale at Gaging.com. 5 Year Warranty, NIST Traceable The PHASE II PTG-3500 coating thickness gauge can perform two diffe.. The new Phase II PTG-3725 is on sale at Gaging.com! THe PTG-3725 can easily detect the thi..